I was amazed to see this in the front garden just now ! 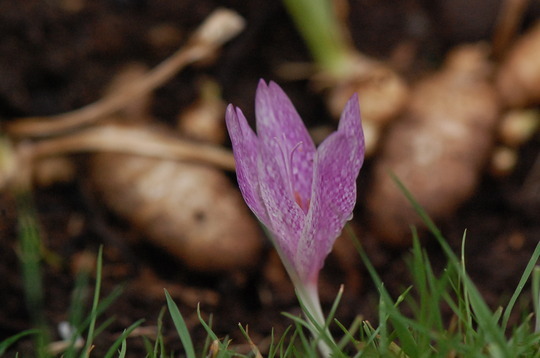 I have autumn crocus flowering now in my front garden, given to me by a friend. Do you have these in the lawn, Louise? They're not Spritz, they're in the south facing border. I thought it was too early until Terra just said hers were out aswell. Mine are in a border, semi-shade. Others which I planted in a drier area under a tree have not yet flowered. Is this the first time you've grown these, Louise? I've not had autumn crocus in my gardens before. One of my GoY questions is about these. This is the first time Terra, i've not had autumn flowering ones before either. Thats not fair C mine are not out yet. Well that's queer BJ, i'm glad mine have settled in though ! See who else is growing Colchicum autumnale (Autumn Crocus).